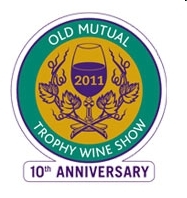 The Old Mutual Trophy wine show has a reputation for being one of the best wine competitions on terms of the way it is run. All wines tasted blind by highly respected judges, a large number of wines entered into the competition and judging audited by PKF accounting firm. The competition is also celebrating it’s 10th anniversary, so it’s well established. This means that the competition is well respected and the awards highly sought after. The winners of the top awards are listed below. To see the full results, visit the Old Mutual Trophy wine show website. If you are interested in tasting the winning wines, there will be public tastings in Cape Town at the ICC on Thursday 9th June 2011, 5pm – 8:30pm and Johannesburg at the Sandton Sun on Friday 10th June 2011, 6pm – 9pm. Tickets are R120.